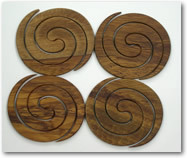 Our selection of tablemats make wonderful gifts for all types of people and occasions. 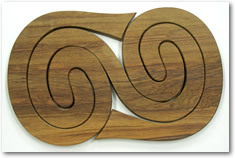 These tablemats are all made from Rimu. They all come packaged securely in the boxes shown in the photos. The primary function of a tablemat is to protect the table from food stains, chips from plates and heat from hot plates or pots. The also serve as decoration in restaurants and as advertising and also in some places they provide fun games and entertainment for customers while they wait for their meal to be cooked. This is a pair of tablemat's one inside the other. 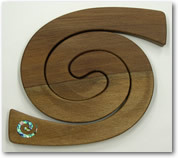 This is a pair of tablemat's one inside the other, and has a Paua Shell New Zealand Map inlaid into one end. 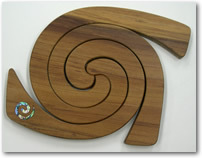 This tablemat also has a Paua Shell koru inlaid into one end. 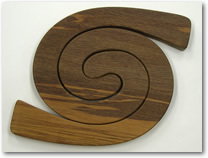 The Koru pattern is a kiwi icon. 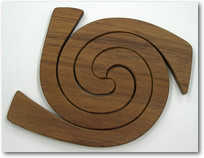 This tablemat consists of three separate tablemats. 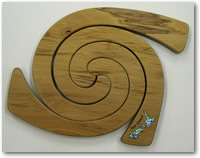 This tablemat consists of three separate tablemats, and has a Paua Shell New Zealand Map inlaid into one end. 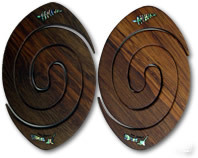 This one has three separate tablemat's each inside the other. These tablemats come in a descriptive box.